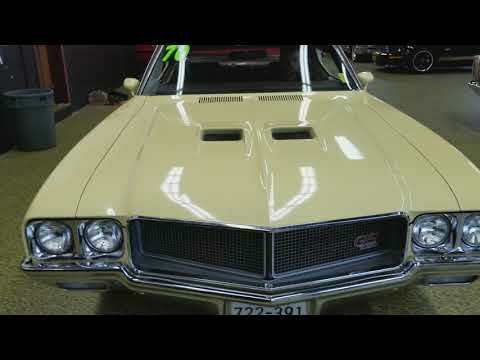 1970 Buick GS 455 Stage 1 , #s match! In 1970 GM finally lifted the ban that intermediately sized cars cannot exceed 400ci's. Therefore, Buick stuffed a brand new 455ci in its newly restyled GS models. The 455 spun a hotter cam with bigger valves and kept the functional hood scoops, sucking up plenty of cold air. The 455s were underrated at 350hp, but an astonishing 510 lb-ft of torque! A Stage 1 option was available with an even hotter cam, bigger valves, and a revised carburetor. Buick rated it at 360hp, but some experts believe that to be closer to 400hp. YES, that is what we have here! It's a true Stage one with build sheet and protecto plate to back it up. The iconic muscle cars still posses the original engine and that stage 1 revised carburetor, a 4 speed transmission makes this a very rare and desirable muscle car. This car is was delivered in Utah and has been repainted from its original Bamboo Cream color but the interior and vinyl top are still original to the car. (there is a used color/era correct seat cover included to replace the driver's seat) The miles are actual and it's been with the current owner for the past 21 years and he purchased it from a gentleman that had it since the 70s. It has not been driven winters or in inclement weather and a look at the underside and floor pans will quickly confirm that. The car runs out very strong and is treat to drive with the 4 speed manual. The paint could use some t.l.c. and does show it's age with chips and wear. (see pics) With only 664 4 speed hard top Stage 1's made, and how solid and original this one is, jump on it while you can. If you would like to inquiry on this classic Buick muscle car call Jay, Jeff or Landon at 507-386-1726 or email "sales@uniquemankato.com" ALL OFFERS AND TRADES WILL BE CONSIDERED.....FINANCING IS AVAILABLE.